Chimpanzees are apes that are closely related to humans. These primates not only share a genetic link with humans, but also have many similar physical qualities. They can come up with different facial expressions that explain their emotions, use their hands for solving different tasks and even show parental care like humans. Chimpanzees are highly intelligent primates and are native to western and central Africa. Chimpanzee diet consists of wide range of food, that includes, vegetation and even meat. Let us go into the details of diet of chimpanzees, but before that let's have a look at some facts about chimpanzee. The Latin name for chimpanzee is Pan troglodytes and they are found in Africa. The chimpanzees are found in areas from Guinea to western Uganda and Tanzania. The chimpanzee habitat consists of rainforest and savannah regions of Africa. The chimpanzees have black hair that is long and of coarse texture. They have naked, flesh-colored face, ears, hands and feet. Some older chimpanzees have black faces. Their arms are longer than their legs and they have no tail, just like humans. They reach a height of about 170 cm in males and 130 cm in females. They weigh about 45 to 80 kg. The average life span of a chimpanzee is about 40 to 50 years. The diet of a chimpanzee is omnivorous as they eat plants and meat. Their primary source of food is plants. They eat during the day and sleep at night, just like a normal human would do. They eat fruits and plants and also eat insects. They have a varied diet and are known to eat different types of food. Let us go into the details of diet of chimpanzee. Their basic diet consists of fruits and plants. These chimpanzees eat different kinds of food available in their wild habitat. They love eating bananas, figs, pawpaws, etc. They will forage through the forests finding edible berries growing in trees or fallen on the forest floor. They also love eating plant parts like flowers, buds, leaves and tree seeds. They even scrape off the bark and resins and eat them up. When the season is dry and fruits are in shortage, they will eat up more of plants. A chimp can eat over 20 plant species in a day. Over a period of year, a chimpanzee may have gorged upon 300 different species of plants. Insects form an important part of their diet. Chimps love eating termites and use ingenious methods to catch termites. They may use their hands or make special tools from stems and sticks to poke out the termites from their termite mounds. They also feed on other insects like ants, bugs, beetles, etc. Chimpanzee diet also consists of meat as these primates tend to hunt small monkeys and baby mammals. 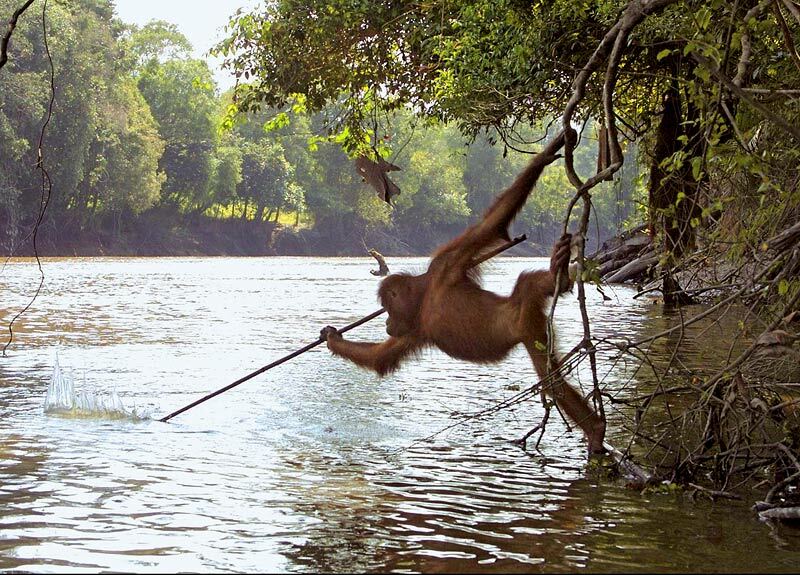 It is mostly the male chimpanzees that hunt for meat more than the females. However, meat consists of only 5% of their diet. The chimpanzees will hunt and eat the meat of baby bushbuks, colobus monkey, young baboons, etc. The chimps also steal eggs and baby chicks from bird nests if given a chance. When the chimpanzees form hunting groups and all the males look out for each other, they end up with higher hunting success. The chimpanzees are known to eat over 200 different types of foods. These are extremely intelligent creatures and learn from experience. They use different tools for hunting, breaking open coconuts or similar hard-shelled fruits, and smoking out the termites and ants from their mounds. Chimpanzees love eating tender leaves and plants. As the closest cousin to humans, chimpanzee diet is extremely varied. In spite of being the closest to humans genetically, chimpanzees are placed under the group of endangered animals. This is due to loss of habitat, excessive hunting and poaching by humans. I hope this article has helped you learn more about the diet of chimpanzees in the wild.